This past May I went on a camping trip to Moose Creek Reservoir near Bovill, Idaho. It's a beautiful little lake tucked up in the mountains and teeming with wildlife. We listened to loon calls, watched young bald eagles chase each other, and listened to the forest come alive with bird song and activity. One morning on my walk along the lake my eye caught something darting around a stand of cattails. It wasn't very large and my first thought was that it was some kind of bug. I crept closer, being careful not to land in the swamp unexpectedly and had to duck as this creature came buzzing by my head and flew to a nearby tree. "That was no bug", I said to myself and decided to wait for a bit to see if it returned. Sure enough, in a few moments it was back flitting around in the cattails again. The bright morning sun glinted off it's iridescent green back and I was able to get my binos on it for a closer look. 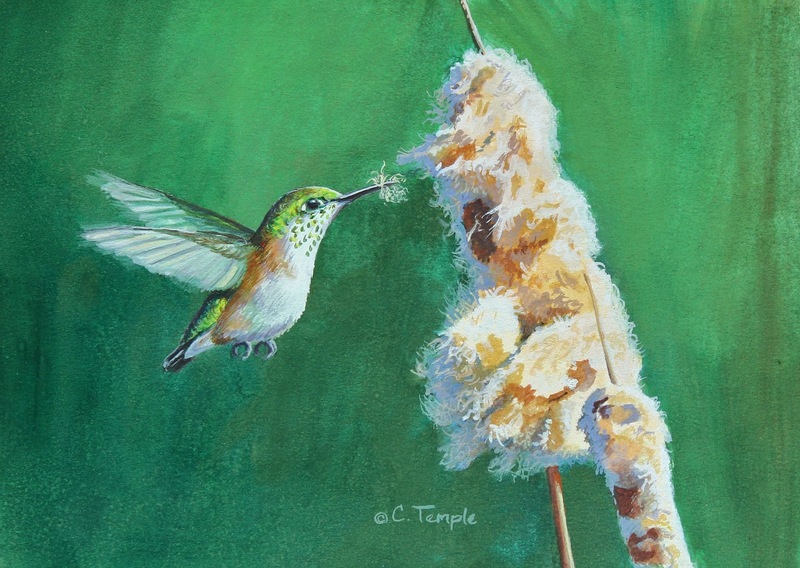 I was surprised to see it was a female Calliope hummingbird busy gathering the cattail fluff for her nest! I had never observed a hummingbird doing this before and it fascinated me so I watched a while longer and made a few mental notes for a painting later. Calliope hummingbirds are our smallest hummer here in the Northwest. They measure a mere 3 1/4" and are common to the mountains. I have seen the males during migration stop at my feeders, but had not seen a female before. I decided to create a painting depicting this little seen behavior and featuring a female. Though never as colorful as the males, they are a worthy subject none the less. 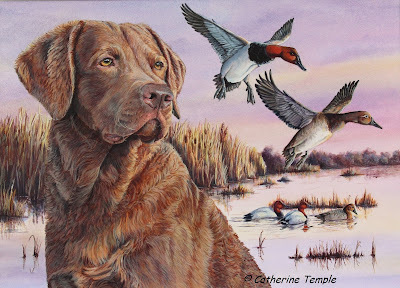 Keeping with my recent experiments in some new mediums I have painted her using casein on illustration board which gave me some wonderful detail. She is available for purchase on my Daily Paintworks website.